My mother suddenly complained about bleeding. 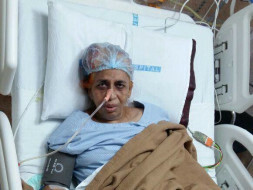 After various tests, she was diagnosed with colon cancer.She is the mother of 3 and the wife of a handicapped husband. She is the best cook I have come across. Under the Govt scheme, she got operated in Seven Hills Hospital, Andheri, Mumbai. 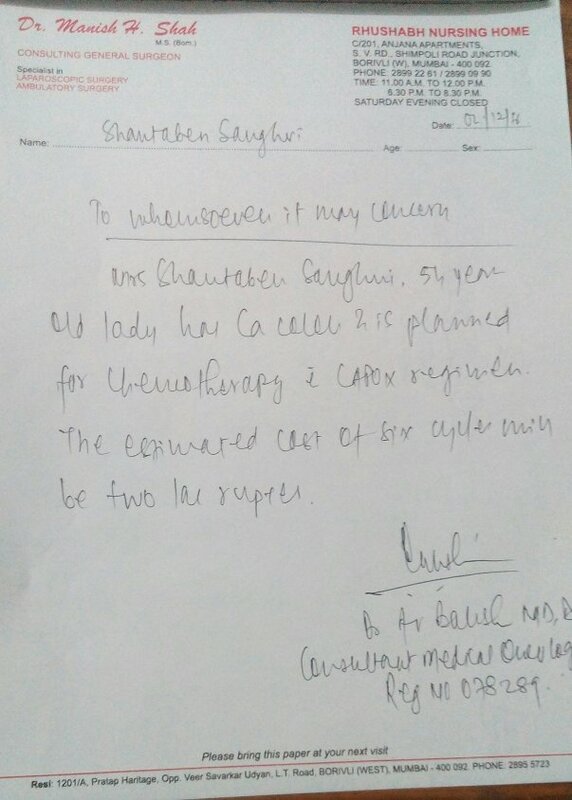 After Operation, doctor suggested chemotherapy, which can cost around Rs.2,00,000/- including medicine, doctor consultancy and hospital charges, post treatment expenses. Since my father is not working anymore, she totally depends on her personal savings, which has already been utilized for various tests like pet ct scan, CT scan, blood test before operation. 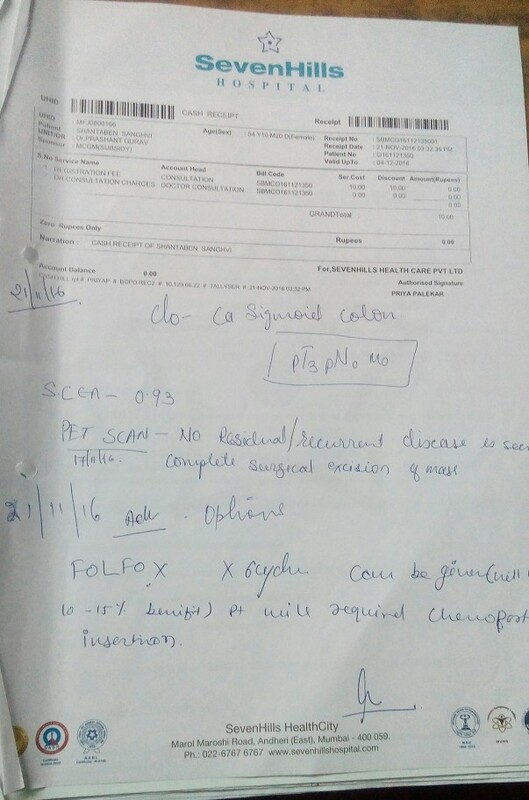 Her surgery was successfully done on 18th October 2016. Due to lack of funds chemotherapy is delayed. I am her daughter, working as teacher. I need your help to complete my mother's treatment. Mother has completed 4 chemos till now. She is not ready for the remaining 2 since she is suffering a lot. But it is a relief that she is out of danger. After consulting Dr. we are monitoring her. Since her pet scan report was normal. I really want to thank Milaap team and donors. Through your generous contribution, Asha’s mother, Shantaben Sanghvi is successfully going through her treatment. Here is a small update on her. With her second chemo session on 27th Dec, Mrs. Sanghvi completed two rounds of chemo. As per the doctor, she would require 6 more chemo sessions. She has to undergo her next chemo 3 weeks after her previous session. Due to low platelet counts, her third chemo session has been delayed. “It is difficult to tell how she is been doing. After her chemo, she experiences burning sensation, pain in her stomach, sometimes vomiting. Her platelet counts are also not stable. Nevertheless, I want to thank all the donors for their. God Bless them!” says Asha. Before and after every chemotherapy, a blood test is required. Each blood test costs INR 4000 and every chemo session costs INR 20000. Her savings have been utilized in her surgery and tests. Any more contribution will only help Mrs. Sanghvi and her family. Do share this campaign and thank you again for being such a great support! Thank you all for your kind and generous support! 1st Chemo has been done successfully 14 days back. She was vomiting for almost 3 days , but is fine now. Second chemo is scheduled for 26th Dec.
May God bless you all in Jesus' Name!